Mauryan Empire Religion: Mauryan Empire was one of the most powerful and greatest empires in India. Founded in 311 BC by the great emperor Chandragupta Maurya, the empire lasted from 321 to 185 BC. Hinduism was the religion at the time of the inception of the first great empire of India. 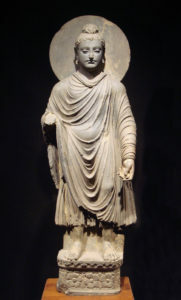 However, in course of time religions such as Buddhism and Jainism flourished. Therefore, the three main religions which thrived during the Mauryan period were Hinduism, Buddhism, and Jainism. At the beginning of Mauryan rule, Hinduism was the only religion that thrived. Chanakya “humbly bows down before the almighty Lord Sri Vishnu” in his Chanakya Niti. During the reign of Chandragupta Maurya, Hindu priests and ministers were highly honored but only until the emperor embraced the religion of Jainism. Although orthodox Hindu priests highly objected to such a religious transformation, the king was adamant to join Jain monks. He had turned a disciple of Acharya Bhadrabahu. In his last days, he had observed the rigid but self-cleansing Jain ritual of Santhara at Shravana Belagola in Karnataka. He died as an ascetic, having fasted to death, in the typical Jain belief. 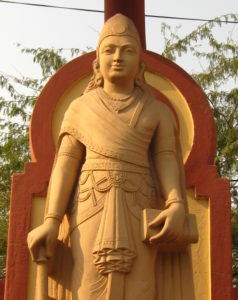 The next ruler of the Mauryan dynasty was Bindusara, the son of Chandragupta Maurya. He is known as the man who conquered “the country between the two seas”. He was not inclined to Jain and Buddhist movements. He was a devout Hindu. The next emperor was Ashoka, the man who made his mark both as a great conqueror and as a Buddhist devout in the Mauryan history. He succeeded his father Bindusara in 272 BC and united the Indian subcontinent for the first time. He led the Kalinga war and after seeing the bloodshed in war, changed his mind to hate war. He initially practiced Buddhism, but later was attracted to Buddhism following the Kalinga war. He sent many Buddhist missions to places like West Asia, Greece, and South East Asia. More than 84,000 stupas all across India were built by him. He convened the Third Buddhist Council of India, a council a council that undertook much work of reform and expansion of the Buddhist religion. However, while being a Buddhist, he had wholly kept back the membership of Hindu priests and ministers in his court. The grandson of Ashoka Samprati also followed Jainism. He was influenced by teachings of Arya Suhasti Suri, a Jain monk. Samrat Samprati is best known to build Jain temples. He built 125,000 Jain temples across India. A few temples are still found in Ujjain, Palitana, and Ahmadabad. He also spread the messages of Jainism to Persia, Greece. The Mauryan Empire gradually declined after the death of Ashoka. None of the kings were strong enough to revive the Mauryan Empire after Ashoka.